The Ship Inn. This ancient coaching inn near the centre of this village was once the venue of the South Gloucestershire Medico-Convivial Society, one of the earliest provincial medical societies in Great Britain. Its membership included the Bath physician Caleb Hillier Parry who read papers on exophthalmic goitre and angina pectoris to the society, and Edward Jenner, practitioner at Berkeley who achieved world-wide fame through his work on vaccination. In 1770 he attended St George's Hospital in London (q.v.) where he was a pupil of the great surgeon John Hunter, returning to practice medicine at Berkeley where he spent most of his professional life as a country doctor. He died there in 1823 and is buried in the church where he has a memorial. His home for many years was the house known as the Chantry which was bought by the Jenner Trust and houses the Jenner Museum. April to September, every day except Mondays. 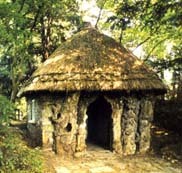 In the grounds of the house stands the Temple of Vaccinia, (pictured left) the rustic hut in which Jenner vaccinated the poor free of charge. The first boy he vaccinated, James Phipps was given a cottage by Jenner which can be seen standing at 3, Church Lane . This was used by the Jenner Trust as its first museum premises before the Chantry was purchased. It is now a private house. Jenner was an active member of a local medical society which met at the Ship Inn, Alveston, and later at the Fleece Inn at Rodburgh, now a private house. Blaise Castle Museum at Henbury. Reconstruction of the interior of a chemist's shop. Frenchay Hospital. The Monica Britton medical museum is now closed. The clock tower of the former Glenside Hospital is easily spotted from the M32 motorway and probably provides a useful landmark to those trying to find their way to the sprawling arrangement of massively solid Italianate pavilions so beloved by the designers of Victorian lunatic asyla. 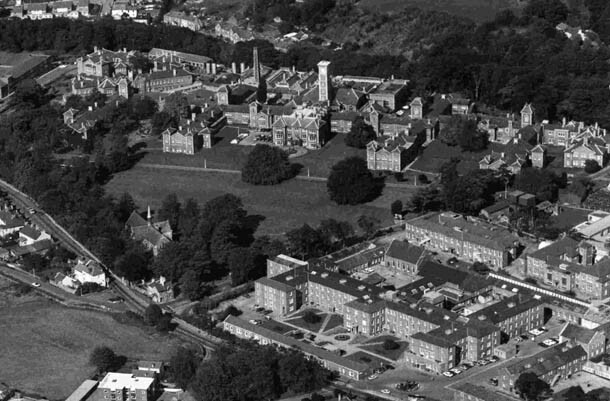 The name Glenside was adopted in 1959 following the Mental Health Act of that year which discouraged any mention of words like ''mental'' and ''asylum'' where buildings were concerned. The hospital dates from 1861 when it replaced St Peter's Hospital and was first known as the Bristol Borough Lunatic Asylum. In 1914 it was taken over by the War Office to become the Beaufort War Hospital. The artist Stanley Spencer painted scenes depicting the day-to-day activities of the hospital (which can be seen at Burghclere chapel in Hampshire). In 1927, there were enough beds to accommodate over one thousand mentally ill patients. 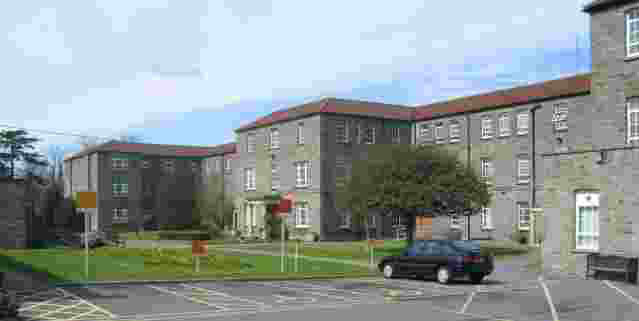 Since its closure as a psychiatric hospital, it has become part of the University of the West of England. The hospital museum is sited in the former hospital chapel. Admission to the museum is free and it is open 10am - 12am Saturdays and Wednesdays. The museum houses a large and varied collection of items including a 1940's operating table, a collection of E.C.T. machines, beds and bedpans, nurse training items, canvas straight jackets and trousers, and work by the in-patients, including drawings and paintings by Dennis Reed, depicting life on the wards in the 1950's. There is also some material on Stoke Park, Brentry (inebriate reformatory and then mental deficiency colony) and Barrow Hospital, the second psychiatric hospital in Bristol. The adjacent Blackberry Hill Hospital, a sombre looking building, was originally built to accommodate French prisoners during the Napoleonic wars. It later became a workhouse, workhouse infirmary and finally an NHS hospital. There are a few geriatric beds in the present day hospital, with the development of a more modern psychiatric hospital behind it. Not far away, on a promontory to the west of the M32 stands an elegant mansion which is currently undergoing refurbishment and which has become associated with the name of Burden. The Rev. Harold Nelson Burden (1859-1930) worked in Ontario, Canada as a missionary where he built four churches and two parsonages before succumbing to ill-health. After his return to England, he helped found an inebriate retreat in Bristol and then set up over 600 beds in inebriate reformatories. He was subsequently appointed a member of the Royal Commission to inquire into the care of the feeble minded. 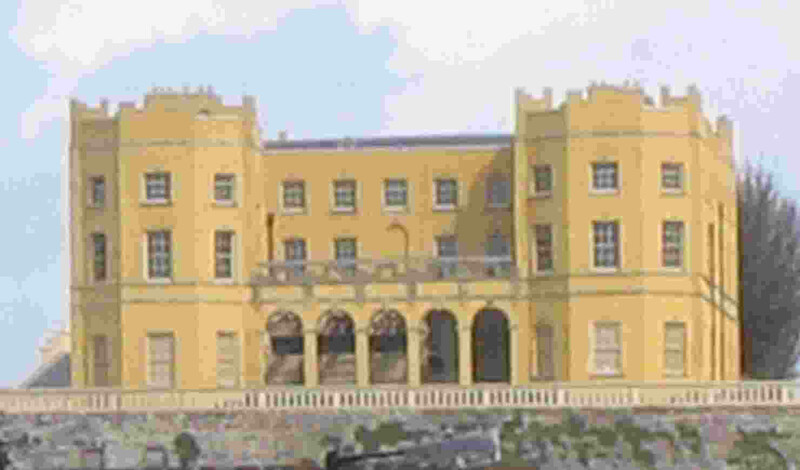 In 1908 he acquired Stoke Park Dower House from the Duke of Beaufort. It was the first institution of its kind to be certified under the 1913 Mental Deficiency Act and formed the core of a colony for 1900 mental defectives. His widow continued the beneficence of her late husband by endowing a large sum to create the Burden Neurological Institute, built in the grounds of Stoke Park. It became internationally known for pioneering work, especially by Dr W. Grey Walter, on the electro-physiology of the central nervous system and the use of the electro-encephalogram. 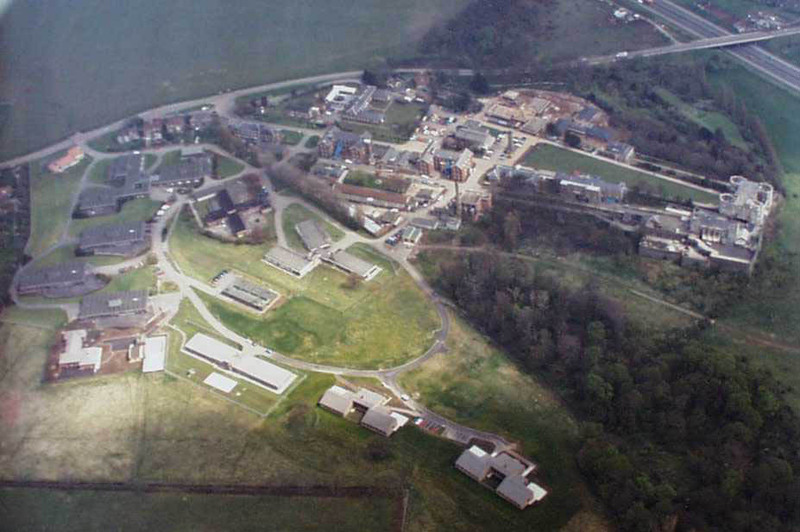 All of the hospital buildings have now been demolished and the site used for housing. The aerial view on the left was taken in 1983. The Bristol Eye Hospital in Lower Maudlin Street was founded in 1810. Bristol Royal Infirmary has portraits in the board room. The Medical School Library has a very comprehensive historical collection of books on the subject of spas and mineral waters (310 vols.) and the 940 volume library of Caleb Hillier Parry which was originally donated to the Bath United Hospital but was transferred to Bristol for safe keeping during the second world war. Brislington House. In 1804, Dr Edward Long Fox established a private mental asylum at Brislington to the south-east of the city. Originally designed as a group of detached houses where patients with different types of mental illness could be separately accommodated, the buildings were later joined together. Some detached houses on the estate were used for "members of the nobility". Staircases, doors, joists and window frames were all constructed of iron to minimise the risk of fire. It was converted into flats in 2001. The grounds are a good example of a purpose- built landscape which was designed to aid the healing of damaged minds. Once a thriving spa, there were two major springs. One was pumped into the Pittville Pump Room (1825-30) which survives and has statuary of Aesculapius, Hygeia and Hippocrates. The other at Montpellier gave rise to the elegant Rotunda which is now a branch of Lloyd's Bank. The Corinium Museum provides an excellent display giving the visitor an insight into everyday life in Roman Britain. Amongst the many exhibits are some examples of Roman medicine phials though these do not amount to much. Cathedral. Statue of Edward Jenner was erected at the west end of the nave in 1826. The folk museum has a collection of doctors books and surgical instruments. Apply to the curator for further information. Gloucester once had a flourishing spa. A spring was discovered in 1814 and the Gloucester Spa Company formed. A pump room was built and a row of magnificent houses which can still be seen in Spa road. A new church, Christ Church was built in Brunswick Road. Unfortunately, the Spa pump rooms are no longer standing and the only thing to be seen of them now is a plaque on a tree by the bowling green. The Gloucester Lunatic Asylum was founded in 1793 and later became known as Horton Road Hospital. Coldwell Rocks, near Lydbrook. An isolated memorial stands near the river Wye to one John Warre, age 16, who drowned here in 1804. The inscription ends with the instruction "apparatus and directions for their application by the Humane Society for the saving of persons apparently drowned are lodged at the church of Coldwell." Here lies a profound mystery for there is not, nor ever has been, a church at Coldwell. Romano-British temple complex in Lydney Park. Permission to visit must be obtained from the agent at Lydney Park Estate Office. Access to the site is from the A48(T). Sir Mortimer and Lady Wheeler excavated this wooded hill-top site in 1928-29. Originally intended as a promontory fort in the 1st century BC, the ramparts enclosed a small community which lived here in rectangular huts for nearly four centuries, making barrel-shaped pots and mining the iron-ore beneath the site. After AD 364, four Roman buildings were constructed, surrounded by a stone wall, the most important of which was a temple dedicated to the native British god Nodens. The layout of the buildings and the discovery of votive offerings, large numbers of pins and canine statuettes suggest that the complex was used as a centre of healing. In some cults, dogs were encouraged to lick the sores of patients with skin diseases, a practice which was thought to encourage wound healing! Many representations of dogs in bronze, bone and stone have been unearthed. Though the foundations of the temple and part of the complex of baths are the only remains of Roman buildings now visible, the terrain of sheer-sided wooded valleys which fall away on three sides of this site stimulate the senses as much as the circulation. A collection of objects excavated from the site is displayed in the small private museum at Lydney Park. though the layout is a bit cramped and lacks explanation. The finest exhibit is a miniature bronze wolfhound known as the Lydney Dog. For memento hunters. modern copies mounted on white marble bases, can be purchased in the museum. Bank House, High Street. Originally the village doctors house, there is an example of communication systems to summon the doctor at night which was in place before the era of the telephone. 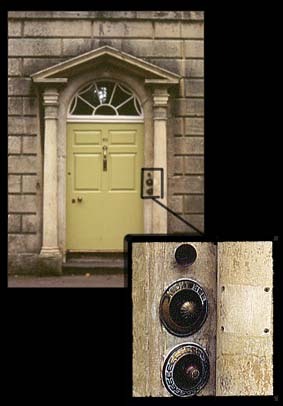 A night bell and a speaking trumpet are still visible to the right of the front door. The speaking tube was connected by a pipe to a similar trumpet shaped gadget by the doctor's bed. The house is now privately owned. The Long Stone at Hampton Fields, just south of Minchinhampton is a megalith pierced by two holes. Like the holed stone at Men-an-Tol in Cornwall, the Long Stone is supposed to have healing properties. Small children would be passed through the holes to ward off smallpox, rickets and other childhood disorders. When some dowsers went to the stone a few years ago, they experienced a large discharge of magnetism from the stone. The dowsers attempted to recharge the stone by forming a circle around it and laying their hands on it. But the procedure had to be curtailed because they all experienced "headaches and fatigue".